I got the automated email from my library letting me know that a book on my hold list had finally come in, but I only vaguely recalled putting a request in and no real memory of why I had done so. But, wow, am I glad I did! The book is set in 1884 London, although with a significant section of backstory set in 1870s Japan. Our protagonist is Thaniel, a telegraph clerk at the Home Office in London at a time when Irish nationalists are trying to instigate a revolution and are throwing bombs at government buildings. It’s also about ten years after Japan underwent a revolution, and they still have their own set of nationalists vs modernists, and have a significant immigrant population in England. 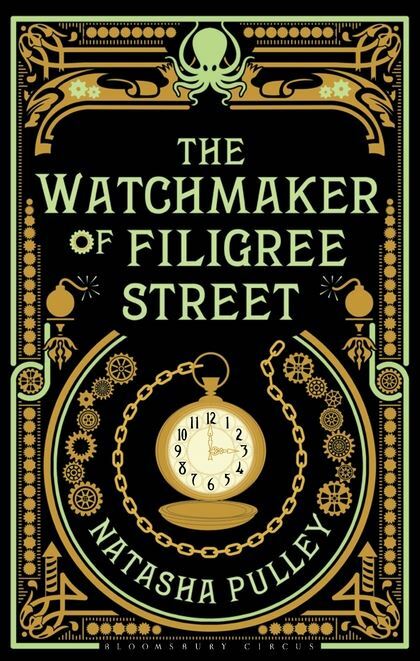 One of those immigrants is Mori, the titular watchmaker of Filigree Street. Another main character is Grace, a female physics student at Oxford college. Then there are dozens of other characters who are all interesting and quirky and suspicious in their own ways. It reminded me a bit of Mr. Penumbra’s 24-Hour Bookstore but better. It’s unclear for a significant portion of the book whether or not there’s a magical/supernatural element to the world. Is this book fantasy, science fiction, or straight up literary fiction? The answer to that would be a spoiler, so I’m not going to answer. The plot, such as it is, is to discover the mystery of a particular watch that came into Thaniel’s possession and saved his life from a bombing. The vagueness of the plot does not stop it from being amazingly suspenseful. The tension really comes from Thaniel trying to figure out just what is going on, and who he should be trying to help versus who he should be trying to hinder. I stayed up way too late finishing this book, the day after I picked it up from the library. The climax wobbled a bit with Pulley trying to add more traditional plotting and tension in unnecessary ways, but I still really enjoyed the book and highly recommend it.